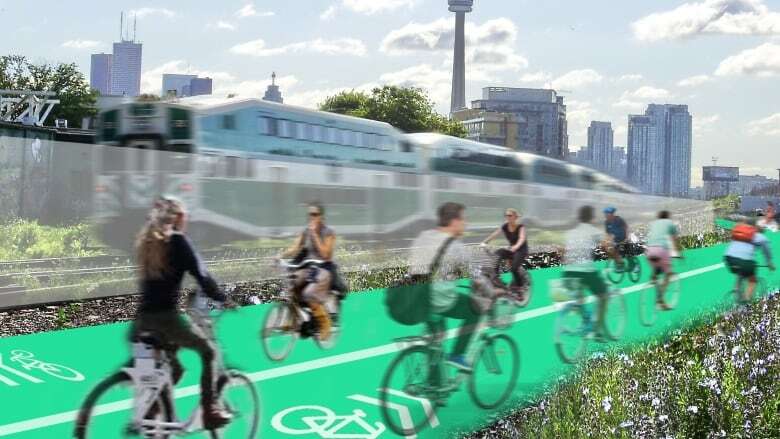 Using the extra space around existing railway corridors to build lanes for cyclists could help the city create a new, conflict-free cycling network, two architects say. But Metrolinx says it's not that simple. Want more bike lanes? Look to Toronto's train tracks. That's the crux of a new proposal from a local pair of architects, who say using the extra space around existing railway corridors to build lanes for cyclists could help the city create a new, conflict-free cycling network. "With this idea, we get over 100 kilometres of bike lanes across the city," says architect and urban designer Naama Blonder from the firm Smart Density, who developed the plan with her colleague Misha Bereznyak. "We can serve not only downtown and the core of the city, but areas that don't enjoy this infrastructure." The gist? Many rail corridors have extra space running alongside them. Blonder says those areas could provide room for low-cost, separated bike lanes — or cycling "highways" — stretching beyond the city's core and away from traffic. In a video promoting the idea, her team notes the "generous width" alongside rail tracks currently used by provincial transportation agency Metrolinx. Dubbing the concept "GO Bikes," Blonder believes it's something the agency could actually explore. "Once you eliminate conflict, you get not only a very safe bike lane, but a fast one," she says. But Metrolinx says it's easier said than done. According to a statement from spokesperson Matt Llewellyn, the proposal "seems to present numerous safety concerns." The agency also only owns 80 per cent of the rail network, he continued. "On the corridors we do own and control, it's important we set aside land throughout the Greater Golden Horseshoe, for the needs of our GO Expansion project." "If we just shut these ideas down from the beginning, we're never going to achieve them," she says. Coun. Joe Cressy, an outspoken advocate of bike lanes, agrees but says when it comes to innovation, beefing up the city's core network needs to be a higher priority. "Do we need more bike lanes? Hell, yes. Where should they be built? They should be built as part of a grid," he says. And so far, even that's lacking, with only six per cent of the network in the city's 10-year cycling plan built over the first three years. "Key arterials" are missing, Cressy says, including extending the Bloor Street bike lanes west and filling in cycling gaps on the Danforth. "You can't have bike lanes to nowhere," he adds. Even so, Blonder says her team's concept could round out the system — if there was ever a willingness to explore it. "It's extremely practical ... and it's so simple," Blonder says.